Ten years of employee-volunteering have been recognised at the York Cares Golden Moments of the Decade’ Awards. The event brought together employee-volunteers, their employers and the community organisations they have supported to congratulate them on the contribution they have made to the city over the past 12 months and the past 10 years. 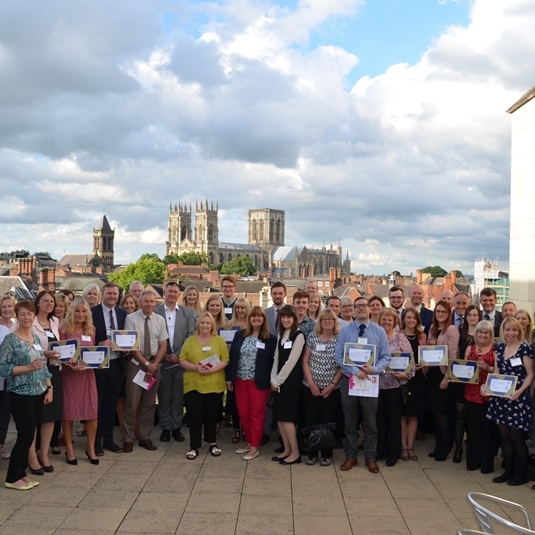 BBC Radio York presenter Elly Fiorentini presented the 2016 awards to volunteers from nine York businesses with a further six organisations receiving special awards for their outstanding contribution over the last 10 years. The Golden Moments of the Decade awards went to North Yorkshire Police, Benenden, Tesco, University of York, Portakabin and The Partners Group. Over 800 employees each year now undertake Team Challenges to help with digging, painting and gardening in community venues. One such challenge was undertaken by a team from Aviva who won an award for their work fundraising and transforming the gardens at Hamilton House Children’s Home. Lindsay Brown from Aviva said: “The rewards from volunteering are absolutely amazing. Firstly, to see the children and the community that you helped really enjoy it, and then as a team yourself you have a good time together and that can only really help the company that you work for”. Windsor House older people’s home is a regular partner with York Cares. Julie Borthwick, Manager, said: “Volunteering is absolutely paramount to an organisation like ours. Our staff work as hard as they can, but to have an extra pair of hands come in is just wonderful and it’s so important to improving the residents lives”. Congratulations to all the award winners and thank you to everyone who helped make the Golden Moments Awards such a fantastic event!